APRIL 2008 -- I recently received a Membership Tip of the Month from National Grange. The article spoke of membership development by using the power of the written word. The best way to discuss this is by calling it advertising. Paid advertisements could be very expensive which many of the Granges could not afford. One of the ways of communicating the Grange Message is by placing articles in the local newspapers. These articles should always have a positive message to convey to the general public. You should contact either the Editor or Reporter for your town and get to know them. Stay in contact with them and let them know when special events are being planned by your Grange. Another method indicated in the article was the use of Posters and Flyers. They should be made colorful to catch the eye of the reader. Remember that the State Information/Publicity Committee is sponsoring a Poster Contest this year. 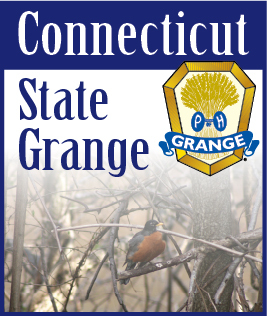 We hope that every Grange will be represented in this contest. The Poster Contest will be judged at “Let’s Celebrate”, July 26th at Good Will Grange Hall. Whatever form of advertising you use for “Getting the Word Out”, one thing that should always be present is our POSITIVE ATTITUDE and our PASSION FOR THE GRANGE!